Most people only know their hourly, weekly or yearly pay rate, but sometimes you may need to know your monthly gross salary in order to fill out certain applications that require information about your income. This is often the case when it comes to applications for loans, housing or public assistance such as welfare, Medicaid or food stamps. Fortunately, finding out your monthly gross wage is fairly simple with a little basic math. Gross income is what you earn at work before taxes or other deductions are removed from your paycheck. Alternatively, net income is what you earn after taxes and other deductions are removed from your check, which is why it is also called your "take-home pay." While your net income is important for budgeting purposes, when most people discuss their earnings they are talking about their gross income. This is, after all, the number for which you agree to work when you start at a company, whether it's $20 an hour, $1,000 a week, $5,000 a month or $150,000 a year. It's important to recognize that this number will not generally be the same as your paychecks say you earn per month even before deductions and taxes. That's because your gross monthly salary is what you will make in an average month, while your actual pay may fluctuate based on the number of hours you worked or how many workdays are in that particular month. When you're trying to figure out your gross monthly salary, your methods will vary based on the figure with which you are currently familiar. Some people know their hourly rate, some know their weekly rate and some only know their yearly salary. 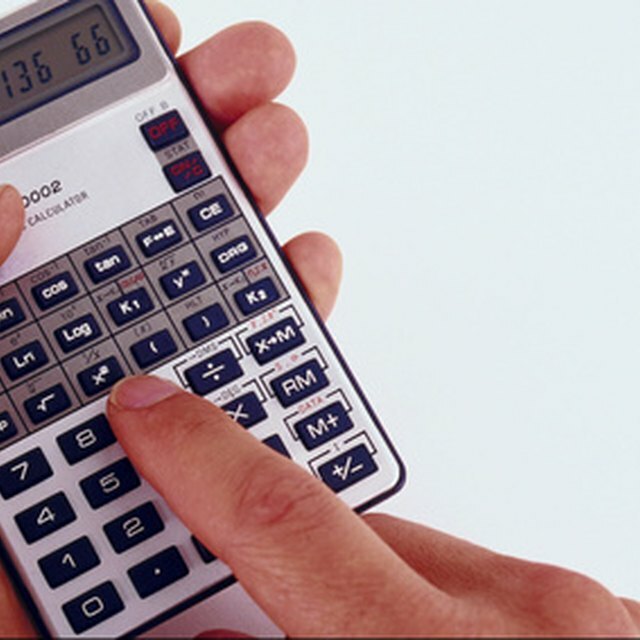 You can always find a monthly income calculator online to do the math for you, but if you prefer to do it yourself, the formula will vary based on the pay period. To determine monthly gross income using your hourly wage, you'll want to multiply your hourly pay by the number of hours you work per week and multiply the total by the number of weeks in a year and then divide that number by 12. For example, if you earn $20 an hour and work 40 hours a week, you would first find your weekly salary is $800 ($20 x 40). You would then find your yearly salary is $41,600 ($800 x 52). Your monthly gross pay would then be $3,466.67 ($41,600 divided by 12). You may be tempted to multiply the number of hours you work per week by your hourly rate and then multiply that by four since that's how many weeks are in a typical month, but because there are 12 months and 52 weeks in a year, that means the actual average number of weeks in a month is 4.33, and this will give you an inaccurate result. To put that in numbers, consider that with the same example used above, the monthly rate would appear to be $3,200 ($20 x 40 x 4), which is more than $200 less than the actual monthly salary. Figuring out your monthly salary using your weekly salary is just like calculating it using your hourly rate, only you can skip the first step since you already know your weekly rate. In other words, if you earn $1,000 a week, you'll need to first find your annual salary by multiplying $1,000 by 52, which comes out to $52,000. Once you calculate your yearly gross salary, you'll just need to divide it by 12 to find your monthly salary, which in this case would be $4,333. The easiest way to find your monthly gross earnings is to start with your yearly salary because all you need to do is divide the number by 12. As an example, if you earn $150,000 a year, your monthly salary is $12,500 ($150,000 divided by 12). If you earn more than one pay rate – for example, if you earn a certain rate on work you do Monday through Friday and another for the weekends – or if you regularly work overtime, your calculations will be a little more complicated. Even so, the concept is still largely the same as calculating the monthly gross income based on your hourly rate, except you will have to do a little more work. To do these calculations, you'll need to multiply how many hours you earn per week at one pay rate by that hourly wage and then do the same for any additional pay rates you earn. You'll then add these all together to find your weekly gross salary and use that number to find your monthly salary. For example, say you earn $15 per hour on weekdays and $20 per hour on weekends, and you work 30 hours between Monday and Friday and 10 hours on Saturday (two of which are overtime). You'd first multiply $15 by 30 to find out how much you made on the weekdays ($450), then find out your base pay on Saturday by multiplying 8 by $20 ($160), then find out your overtime rate by multiplying $20 by 1.5 ($30), and then find out your overtime earnings by multiplying $30 by 2 ($60). Add these all up to get your weekly pay and you would find that you earn $670. Multiply that by 52 to find that your yearly salary is $34,840. Finally, divide that number by 12 to find your monthly salary, which in this case would be $2,903.33. Since most bonuses and commissions are hard to estimate because they fluctuate regularly, the best option is to add up all of your bonuses from the last year and then divide them by 12 to find your monthly bonus rate. You can then add this to your monthly base gross salary to estimate a realistic monthly gross pay rate. For example, if your base gross monthly salary is $3,000 and you earned $12,000 in bonuses last year, you would first find that your monthly average bonus was around $1,000 ($12,000 divided by 12) and then add the bonus rate to the base rate to find your total monthly gross salary was $4,000 ($3,000 + $1,000). If you can't really guess how much you earn per week based on your hourly wage because your hours vary so greatly from week to week, the best thing to do is to estimate what you earn yearly by looking at your past year's paychecks. You can't just add up your checks themselves because these will have the taxes removed, but if you still have the pay stubs, you can see your earnings before deductions and taxes. Add these up from the last year and then divide the total by 12 to find your monthly earnings. If you haven't worked at the company for a full year yet, you can add up whatever paychecks you do have and then divide them by the number of pay periods covered by the checks to find your average pay per pay period. Multiply that total by the number of pay periods you have in a year (52 if you are paid weekly and 26 if you are paid semi-weekly) to find your average yearly salary. Next, divide this total by 12 to find your monthly salary. For example, if you are paid semi-weekly and earned $899, $1,080, $1,508 and $300 in your last pay periods, add these up and divide them by 4 to find your average pay per pay period ($946.75). Then, multiply that by 26 to find your annual salary ($24,615.50) and divide that by 12 to get your monthly gross salary, which would be $2,051.29. To figure out your monthly take-home wages, subtract your deductions, such as payroll taxes and voluntary deductions, for the month from your monthly gross pay. IntuitTurbo: What is Gross Monthly Income?